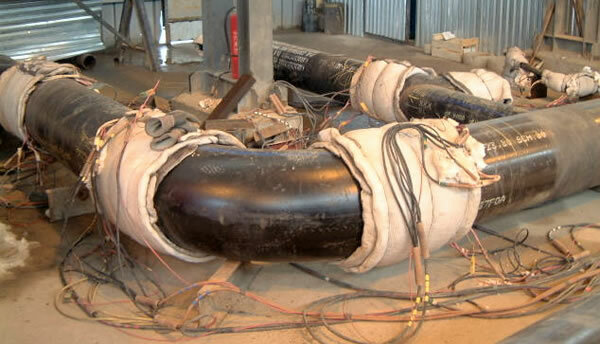 As an example, you may have a requirement for a stress relieve Post Weld Heat Treatment (PWHT) cycle of 600°C for 2 hours, with a 200°C per hour heating and cooling cycle, but the welding procedure (WPS) you have at your disposal was qualified on 620°C for 1 hour with a 100°C per hour heating and cooling cycle. Would the PWHT on the WPS be acceptable for this application? Glowing Electrical Resistance Heating Elements (Also called heat beads) - Normally it will be covered with insulation, so you will not see it glowing. To answer this type of question, for comparing heat treatments, Holloman Jaffe parameter calculations are typically performed. Please note that within the context of this discussion, we are comparing tempering or stress relieving type of heat treatments. Experimentation and thermodynamic calculations show that the microstructural changes brought about by thermal heating of materials are exponentially related to the temperature that is used, but is only linearly associated with time. As an example, the increased “softening” between using stress relieve temperatures of 600°C and 660°C is much more than just the 10% increase suggested by the rise in temperature. On the other hand, an increase from 1 hour to 1 hour and 6 minutes (also a 10% increase) will however have a very small effect. When comparing heat treatments, these effects need to be taken into account. Comparing heat treatments with the Holloman Jaffe parameter only works if we assume that the temperature range we are working with will not result in an equilibrium phase change. For example, for carbon steels, the lower critical temperature (Temperature where the ferrite structure starts changing to austenite.) is typically given as 723°C. We will therefore only be looking at heat treatment temperatures significantly below this temperature. Please note that this lower critical temperature is higher for alloyed steels. An equation was developed to take the heat treatment temperature and time, and express it as a single number. This number is called the “Holloman Jaffe Parameter.” By calculating the Holloman Jaffe parameter for each of the heat treatment cycles, comparing the heat treatments becomes relatively simple. Hp = Holloman Jaffe Parameter. T = Temperature in degrees Celsius of the heat treatment. t = Time at Temperature in Hours for the holding temperature. So, if we know the different stress relieve times and temperatures for different stress relieve cycles, we can compare them using the equation above. Typical Set-Up for Local Heat Treatment on Pipe Girth Welds. - This is electrical resistance heating with insulation in place. thc = Time in hours calculated to compensate for the heating or cooling portion of the heat treatment cycle. T = Holding temperature in degrees Celsius for the heat treatment. r = Heating or cooling rate, in degrees Celsius per hour, above 350°C, to the holding temperature. Let us apply this equation to our examples above. Our cooling rate was the same, so we will get the same value for tc(1) as for th(1). The total additional time will therefore be: th(1) + tc(1) = 0.11 + 0.11 = 0.22 hr. This means that the total time at temperature will be: t = t(1) + th(1) + tc(1) = 2 + 0.11 + 0.11 = 2.22 hr. We can now use this time, and place it into the Holloman Jaffe equation to obtain a new Holloman Jaffe parameter that takes into account the heating and cooling parts of the cycle as well. We note that the value for Hp(1) is now slightly higher, to compensate for the heating and cooling parts of the cycle. In the same way, tc(2) = 0.22 hr. The total time to use in the Holloman Jaffe equation then becomes 1.44 hr. This shows us that the second heat treatment cycle will have a greater effect on the weldment, even though the time at temperature was half the time of the first cycle, while the temperature was only increased by 20°C. Just something else to keep in mind: Sometimes a component may be subjected to more than a single heat treatment cycle. This can happen if repairs are required on a weldment that had already been post weld heat treated, or if the entire component cannot fit in the furnace in a single charge. 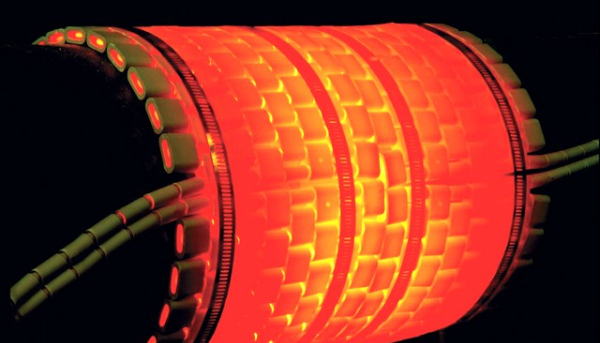 Then different sections of the component may be heat treated separately, with the final “overlapping” section seeing at least two heat treatment cycles. These calculations can obviously become tedious, but they do lend themselves to being performed on a spreadsheet. You can download an Excel spreadsheet to do these calculations by clicking here. The spreadsheet allows not only simple comparing of heat treatments, but also allows you to calculate the Holloman Jaffe parameter for multiple heat treatments.